CAN YOU WASH YOUR FACE WITH HAND SOAP? 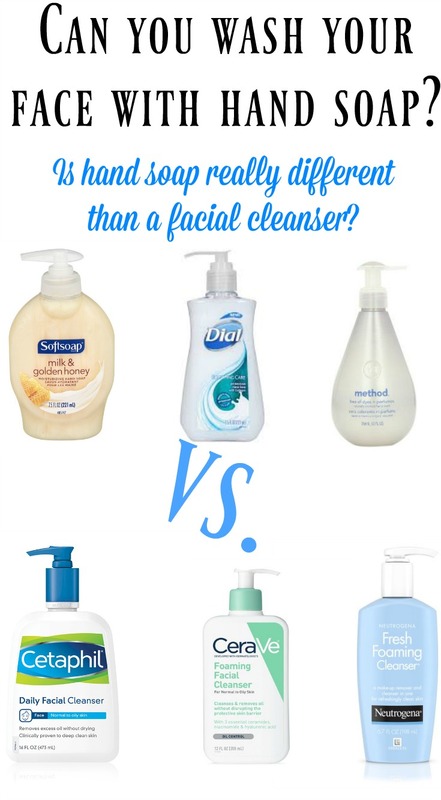 COMPARISON OF 3 LEADING HAND SOAPS WITH FACIAL CLEANSERS! Can you wash your face with hand soap? 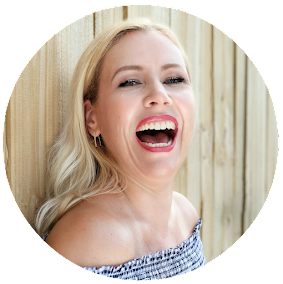 I just shared with you, why my skin looks better with 41 than with 37 and I remembered, while writing the article, that I used to wash my face with hand soap! I do believe it is important to always wash (at least at night) our face- especially if we are using makeup during the day. Which got me thinking, does it really matter, if we use a facial cleanser or can we just use a hand soap to wash our face? Since I have used a hand soap to wash my face in the past, I can tell you, that I find it works just fine. But I also have to admit, that I don´t have very sensitive skin. I have however used Softsoap on my face without any issues! I actually thought it felt quite hydrating and gentle! There are so many soaps out there—from cleaning our hands, hair, and faces to a variety of household cleaning jobs, such as dishes or laundry. But are they really all different? 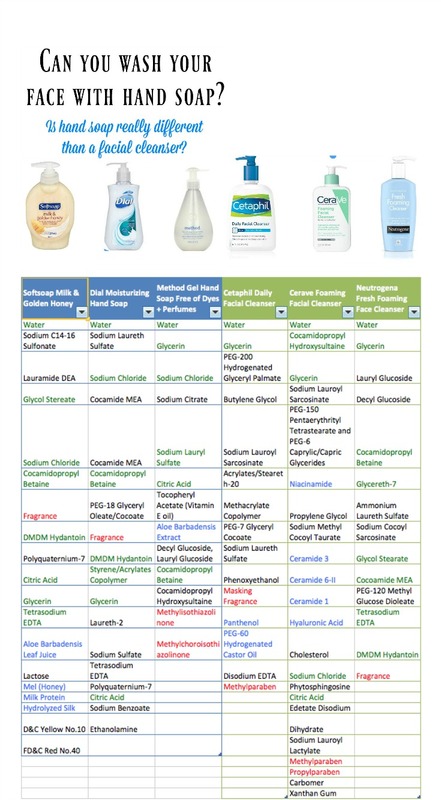 I took 3 leading hand soap brands (Softsoap, Dial, Method) to compare their ingredients with 3 leading facial cleanser brands (Cetaphil, CeraVe, Neutrogena) to see if they are really so different! All 6 products contain as first their ingredient: Water! All 6 products also contain Glycerin. Glycerin is a skin-replenishing and skin-restoring ingredient, meaning it is a substance found naturally in skin, helping to establish normal balance and hydration. While all 3 hand soaps include Sodium Chloride (which is nothing but a fancy scientific term for.... salt! ), only 1 of the facial cleansers includes it (Cerave). Why do they put salt in our soap? While adding sodium chloride to our soap can be drying it also helps to form a product that is less soluble in water. Ah OK! Here is something to consider for our sensitive gals: 4 of these products contain fragrance- which isn´t a good choice, if you suffer from sensitive skin. Which soaps don´t contain fragrance? The Method hand soap free of dyes + perfume (as the name suggests!) as well as the Cerave facial cleanser. To my own surprise the Cetaphil contains a "masking fragrance". Cocamidopropyl Betaine is derived from coconut oil. The Neutrogena Facial Cleanser includes this skin-conditioning agent just like all 3 hand soaps do. However the Cetaphil facial cleanser includes PEG-7 Glyceryl Cocoate which is very similar and also derived from coconut oil. Cerave uses instead Cocamidopropyl hydroxysultaine which is also similar to cocamidopropyl betaine. None of the 3 hand soaps includes parabens- but to my surprise 2 of the facial cleansers do! Cetaphil includes Methylparaben and Cerave includes Methylparaben and Propylparaben. Parabens are controversial, as they might be linked to skin cancer. So in this case all 3 hand soaps are a better choice than 2 of the facial cleansers! The Cerave facial cleanser contains Citric Acid just like all 3 hand soaps do too. This is derived from citrus fruits and used primarily in small amounts to adjust the pH of products to prevent them from being too alkaline. I marked ingredients that are common in all/most products green, desirable ingredients blue and questionable ingredients red. One thing all these soaps have in common is their chemical origin; they were all made by mixing fat or oil with a strongly basic solution. And it was no surprise for me to see, that the ingredients of all 6 products are not that different from each other. This hand soap includes all standard soap ingredients. I like that it contains Aloe Barbadensis Leaf Juice which can be great for dry skin. It also contains Honey, Milk Protein and Hydrolyzed Silk (Silk protein hydrolized with the addition of acid or enzymes.). It also contains Lactose which some people are not tolerant to. It contains color additives which are not important at all in our skin care and none of the other products include these- however according to the EWG these are not very dangerous (D&C Yellow No.10 is rated 1-3 - 10 being the most dangerous and FD&C Red No.40 is rated 3). A surprising easy and simple put together list of ingredients- nothing in here is very questionable, except that again those with sensitive skin might not like the added fragrance! I haven´t used this one myself on my face, but from the ingredients this is a hand soap that you could use on your face and it is quite similar to the Neutrogena facial cleanser! As the name suggests, this product does not contain dyes or fragrances- great for our sensitive gals! It also contains calming and soothing Aloe! We are presented a short and sweet ingredients list - however it contains Methylisothiazolinone which is according to the EWG´s skin deep database a possible human skin sensitizer irritant and rated a 7 (out of 10 being the most dangerous). But it is listed as last ingredient (therefore the smallest amount included)- overall this could be a good facial cleanser! I always assumed Cetaphil is fragrance free- but nope! It isn´t. So this could be again an issue for our sensitive boys and girls! ;-) This facial cleanser contains Methylparaben which is a questionable ingredients as it might be linked to skin cancer. Panthenol and Castor oil are nice nourishing and hydrating add ons! The Cerave Cleanser has pretty similar ingredients than all the hand soaps, however I like to mention that Cerave includes a whole group of Ceramides, Niacinmide as well as Hyaluronic Acid which are ingredients that I find desirable and helpful in your facial cleanser- however the fact that Cerave also includes 2 parabens (Methylparaben and Propylparaben) makes the whole product again questionable, as those ingredients might be linked to skin cancer. You see, all of the 3 hand soaps as well as the 3 leading facial cleanser are all not so different from each other! They contain Water, Glycerin, some Fatty Acids made out of coconut oil and conditioning skin agents and in most cases also fragrances. If you have sensitive skin than you might try a fragrance free hand soap- otherwise: stay away from using a hand soap as your facial cleanser! I think the best method to see if you can use a hand-soap on your face is simply by trying it out though. Does it feel drying, or even uncomfortable or do you feel no difference to your facial cleanser? Decide for yourself! I don´t see an issue here in regards to the ingredients. After all our hand soaps have evolved very much too, because nobody wants to have dry hands, right?